Feature: Special Letter: Where Are the Sensors for Smell and Taste? So How Does the Nose Work? How Do You Identify a Smell? Do Dogs Really “Smell Better” Than Humans? Publisher’s Note: For hundreds of years, if not longer, humans have had the dream of understanding, and then re-creating, the power behind the sense of smell. All of us are aware of the near-hypnotic power of this “fifth” sense, which seems to have a direct path not only to the brain, but also to our emotional associations with the past and present. Who would not want to finally “crack the code” on how it works, as Linda Buck and Richard Axel did, earning them the Nobel Prize in 2004? I had the opportunity to spend an evening over dinner with Linda a few years ago, and to hear firsthand how she did her groundbreaking work, and what she found. Her description of our olfactory system was both complex and mesmerizing. While most of us are more focused on the senses of hearing, touch, and seeing, there is something special about the related senses of smell and taste: in both cases, one is actually consuming the molecules of the thing being sensed. When you see a wet dog, you are having a remote sensing experience. But when you smell it, a very small part of that dog has just become part of you – at least for a while. 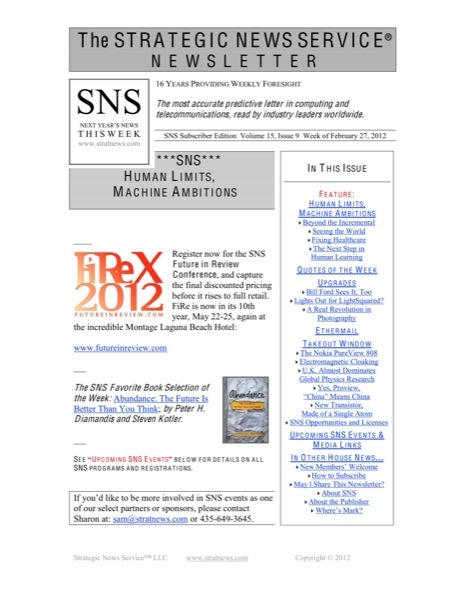 In this week’s discussion, SNS members will learn of a groundbreaking new technology and company that allow us to reproduce the exquisite sensibility and sensitivity of human smell and taste, in an organic microarray that does not require living cells. It’s hard to believe, but true. And that, alone, is why every member will want to read on. We are very proud that Aromyx has been selected as one of our 2016 FiReStarter companies. If you want to learn more, read on. And if you want to meet the founders, join us for FiRe 2016. – mra.